Preparing for your first hiking trip with kids can feel both exciting and daunting. These expert tips will help make family adventures run as smoothly as possible. Oli Reed runs The Outdoor Dad blog, which is packed with advice for family adventures and how to find the best outdoor gear for kids. 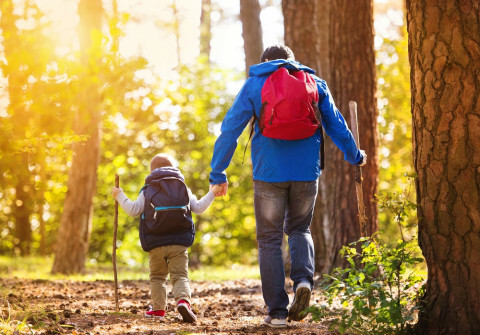 Here are five key lessons he’s learned about hiking with children. Key factors like distance, location and terrain will depend on the age and experience of your children, but the key is not to try too much too soon. You should ease kids into hiking gradually, growing their love for the outdoors before aiming for ‘epic’ trips. Babies are surprisingly easy to hike with because they’re usually happy to bounce along for long periods in carriers, which allows to you get off-road on things like woodland trails. Circular routes with the option of a quick shortcut back to your start point are a smart move; and if you’re using a pram or buggy consider the surface you’ll be walking on, because it must be wheel-friendly. With toddlers and older children, keep the route fun, simple and engaging. Choose a route you know they can manage physically and that will finish before they get bored. Think rivers, woodlands, stepping stones, waterfalls, beaches, castles, tunnels, bridges – and a cafe or shop along the way where you can reward them with sugary treats! You might enjoy battling against rain, wind and snow – but you can pretty sure your kids won’t! They may like jumping in muddy puddles and running around your garden in the rain, but endless hours exposed to the elements are a surefire way to crush all future hiking enthusiasm for good. So stay flexible with your plans and don’t be afraid to cancel a trip at short notice to wait for dry conditions and mild temperatures (you don’t want it to be too hot either). It’ll be worth it in the long run! If your idea of a good hike is lacing up your boots and walking until sunset, you’re about to be disappointed. With kids you’ll be stopping - a lot! 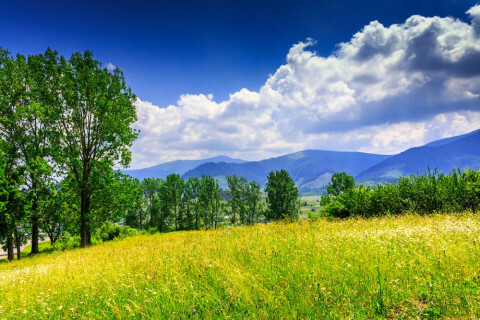 So you need to make the hike fun and interesting, which with so many great natural distractions is easier than you might think. You can skim stones, eat berries, paddle in rivers, climb trees, jump in puddles, hunt for creepy-crawlies, feed birds, play hide and seek – all of the things you used to love doing when you were a child. If you’re carrying a backpack, get a smaller children’s version so they can be just like you. If you have a dog, let them hold the lead while you walk. If you’re navigating with ViewRanger, let them take charge of your phone so they can use the maps. If you’re birdwatching, teach them how to look through binoculars. And create a game of nature bingo before you set off by printing a couple of sheets of paper with names or pictures of things you may spot on the route. First one to tick them all off wins. If you think you get hungry on hikes, times that by around 1,000 with kids. 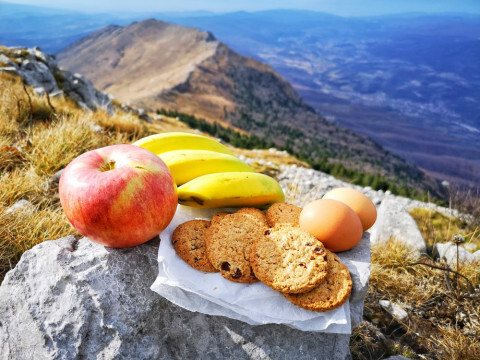 Just when you think you’ve packed enough sandwiches, fruit, crisps, chocolate, sweets, cookies, juice and water into your backpack – pack some more. Because an energy crash a mile from the end of your route is the last thing you need. Get your kids involved with food preparation too, by asking what snacks they’d like to take. You could even make homemade treats to take with you – like trail mix or flapjacks. Walking with other families doesn’t just mean adult company for you, it also means children can entertain each other. If you’ve got friends with kids who like hiking, or who might have mentioned they’d like to try it, invite them along. 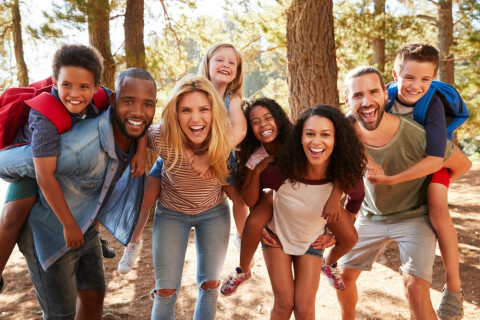 It means you’ll have someone to help plan the trip, someone to help entertain the kids and keep everyone safe and happy while you walk, and someone to share what will hopefully be a fun and memorable experience.